Many people living in California may have an avocado tree in their yard or know someone who does. So when I have mentioned to friends and acquaintances that we have an avocado grove, their eyes light up with curiosity. They often ask how to improve their growth and production. As I understand, sometimes backyard avo trees are stubborn producers. I am no expert on avocado tree management. We have our grove manager, Gary, who is a living encyclopedia on the subject, to help advise us about how to increase production and we generally just nod and tell him to go ahead. But I can report to you all the stuff that Gary does and maybe some things might help your backyard tree. 8 pounds per tree with 11-7-14+18S+1Zn+Fe, that’s ratios of 11 nitrogen, 7 phosphorus, 14 potassium, 18 sulfur, 1 zinc, and iron. 4 pounds per tree with sulfate of potash (0-0-50). 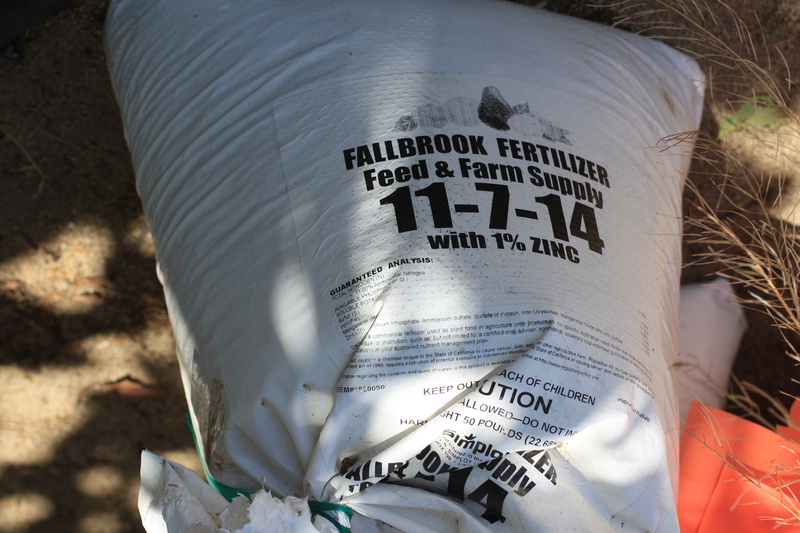 All fertilizers in our grove were hand broadcast, but some fertilizers can be injected into the irrigation systems. At the same time, each stumped and mature tree was injected again with nutra-mix P+K phosphorus acid 0-28-25. This is the same as the injections done in the fall (see previous post). So these are done twice a year. Injections are made into alternate limbs and trunks from the previous injection spots in the fall. Recall from the previous post that we are using a “cool” phosphorus acid that requires more holes, but results in less burn. The method is to drill two 7/16″ holes angled 45 degrees down, inject 1 ounce per tree, then refill each hole for a total of 2 ounces per tree. Below are some pictures of new and old injections as examples. We have 68, 5-month-old stumped Hass trees and 97 tall, mature Hass trees. The same amounts of fertilizer and phosphorus acid injections were applied whether the trees were stumped or fully grown. This is because the root systems on the stumped trees are still as large as if they were full size trees. These are management practices done for mature trees. We are in the process of planting new trees (in the next week!) to replace the ones we recently removed in the fall. The fertilizer regimen will be much different for those trees. Stay tuned for reports on that. In the meantime, spring was glorious when we recently visited the farm in early May. Enjoy the photo gallery of the splendor below. Beautiful new leaves on 5-month old stumped trees. Some of our stumped trees are very full of new growth! Busy bees working their magic. This entry was posted in Avocado Farming and tagged avocado, avocado farming, feeding avocado trees, fertilizer, Hass, increase avocado yield, phosphorus acid injection, Phytophthora cinnamomi, root rot. Bookmark the permalink.